If the picture selected is contained within an article on our website, you will have the choice of going directly into that article. We do our best to keep the pictures organized in alphabetical order by make, however there are always additional pictures way at the bottom waiting to be positioned that you might enjoy as well. Click on any of the pictures below to expand to full size – then use the back arrow key to return to this gallery in order to see other images. A gathering of gearheads, somewhere in New York state circa 1959. 1994 ALFA ROMEO 164 Quadrifoglio 4. The “Q4” version was an all-wheel-drive model added for 1993. The Audi Museum located on the grounds of company headquarters in Ingolstadt is a must see for any automotive history buffs visiting southern Germany. 1973 BMW 3.0 CS formerly owned by Jerry Garcia, photographed in 2013. Carolyn Garcia (a.k.a. “Mountain Girl”) photographed taking her former husband Jerry Garcia’s 1973 BMW 3.0CS out for exercise. BMW employees reveal M6 convertible, M6 coupe, X1 sport utility, and 6-series sedan models to the automotive press at the New York Auto show April 4, 2012. 2014 BMW Z4 at the 2013 New York International Auto Show press preview. According to legend, several customized 2- and 4-door 1971 Buick Electras with a third drop axle were built over four decades ago. While not factory grade, the custom work is better than average. According to legend, several customized 2- and 4-door 1971 Buick Electras with a third drop axle were built over four decades ago. While not factory grade, the custom work is better than average. But why? A 1973 Buick Electra – navy blue with white vinyl top and chrome mag wheels. 1978 BUICK SKYLARK sedan, with base model hub caps. A 1940 Cadillac LaSalle customized into 8-door woodie wagon form. 1953 Cadillac Coupe de Ville with original style wire wheel covers. Here, an original-specification wire wheel cover is seen on a 1956 Cadillac. three 1959 Cadillac Eldorados, one 1959 Series 62 and a 1956 Eldorado at the Cadillac Big Meet in Upper Austria, AT. A closer look at Cadillac’s “vicodec” roof, standard on all 1957-59 Eldorado Broughams. 1957 model shown. 1967 Cadillac Coupe de Ville wreath and crest. A 1967 Cadillac Coupe de Ville in repose in Tucson, Arizona. 1967 CADILLAC COUPE DE VILLE, without vinyl roof. A 1971 Cadillac Calais sedan base model with no vinyl roof rolls down the assembly line, followed by a Coupe de Ville. 1972 CADILLAC COUPE DE VILLE front end. 1972 CADILLAC COUPE DE VILLE. A 1973 full-size Cadillac rolls down the assembly line in Detroit. New 1975 Cadillacs are loaded into “Stak-Pak” rail cars for delivery. A 1976 Cadillac Eldorado convertible on the assembly line in Detroit. These commemorative license plates were issued during 1975 and 1976 in the state of New Jersey. The state normally requires front license plates to be displayed, but suspended that rule during the time period shown along the bottom. 1976 CADILLAC FLEETWOOD, photographed at Millburn Dowtown Car – Show May 2010. Few things say luxury like the word Brougham in cursive writing. A 1976 Cadillac Fleetwood Brougham with padded soft-touch vinyl roof covering. A 1977 CADILLAC promotional picture for the downsized Fleetwood and de Ville models introduced for that model year. 1977 Cadillac Sedan de Ville on the assembly line. Directly behind it is a ’77 Coupe de Ville. 1977 CADILLAC ELDORADO CONVERTIBLE. While GM stopped offering convertibles from the factory, aftermarket customizers used factory top parts to create 1977 Eldorado convertibles that were factory grade. 1978 CADILLAC ELDORADO CONVERTIBLE. While GM stopped offering convertibles from the factory, aftermarket customizers used factory top parts to create 1977-78 Eldorado convertibles that were factory grade. Here, a 1978 Cadillac Coupe de Ville sits next to a 1978 Ford Thunderbird Diamond Jubilee Edition. On this 1978 Cadillac assembly line, vinyl roofs have already been fitted to the vehicles. Because the red Eldorado was not fitted with one here, it likely was going to be sent to elsewhere for fitment of a Biarritz package. Full padded vinyl roofs such as this one were equipped on 98% of all Cadillac de Ville and Fleetwood models in 1979. 1979 CADILLAC SEDAN DE VILLE tail light. (1991 CADILLAC FLEETWOOD BROUGHAM) The final three years of the full-size 1977-1992 Cadillac body style featured aerodynamic headlights and lower plastic bodycladding. Leather seats from Cadillacs of late-1970s through early 1990s vintage tend to resemble the plush chairs of an ivy league law library. 1964 CHECKER MARATHON. From 1959 through 1982, the Marathon model saw no annual styling changes whatsoever. Their simplicity and durability made them favorites of taxi companies. Wisconsin resident John Romppainen’s 1953 Chevrolet Bel Air was picked to chauffer Marion Ross and the late Tom Bosley (aka Marion and Howard Cunningham) from the long-running ’50s-era sitcom “Happy Days” — for a day of festivities and the unvieling of a bronze statue of The Fonz in Milwaukee. This styling proposal for the 1957 Chevrolet is dated May 21, 1954. It was early in the design process and some ’56 styling cues were included on this car. In fact, a variation of ’55 grille was used on this car. Chevrolet believed that the ’55 grille was not well received by the public and changed it for 1956, but this styling study was made before the ’55s had been introduced. Elfi Arkus-Duntov, wife of Corvette engineer Zora Arkus-Duntov with her 1955 Chevrolet Corvette, photographed in a suburb of Detroit, Michigan. 1957 CORVETTE equipped with American Racing “Torque Thrust” style wheels. 1959 Chevrolet Impala bodies receive paint on the assembly line. A 1959 Chevrolet Impala pre-assembled front clip is lowered on to the vehicle frame. Here, the first bits of interior trim are fitted to this 1959 Chevrolet Impala. 1959 Chevrolet Impalas on the assembly line. A 1963 Chevrolet Impala SS coupe with vinyl roof covering. This photo captures a Chevrolet dealership service department in the 1960s. In the foreground is a 1965 Impala, and on the closest service bay is a 1949 Chevrolet. In 1981, Mike Grady took his newly-acquired ’66 Corvette Sting Ray off the road to begin restoring it. Thirty years later in 2011, he was finished. For this picture Mike returned to the location where he took his first picture of the car at age 22 in 1980. The now-vacant building once housed a machine shop where he worked at the time. Since vinyl roofs were perceived as sporty during the 1960s, they were offered on musclecars such as this 1967 Chevrolet Camaro SS. 1967 CHEVROLET BEL AIR base model hub cap. 1967 CHEVROLET BEL AIR. The narrow inline 6-cylinder base powerplant leaves a great deal of room on both sides of the engine bay. 1967 CHEVROLET BEL AIR sedan. Only RS versions of the Camaro featured hidden headlamps as seen on this ’67 coupe. A prototype styling exercise of the second generation Chevrolet Camaro, in notchback form. 1970 Chevrolet Camaro SS, with factory moon hub caps. Downward view of a 1974 Chevrolet Monte Carlo coupe, with landau vinyl roof covering. An abandoned 1976 Chevrolet Impala coupe in Detroit, 2013. The vinyl roof covering on this 1929 Chrysler 4-door sedan is an example of how many sedans and coupes were decorated from the mid-1920s through the mid-1930s. The new-for-1934 Chrysler Airflow’s modern, integrated metal roof was key to creating a look of pure, smooth lines. As the original “aero” look of this car inspired other designers to create similar designs, vinyl roofs became yesterday’s news. This 1976 Chrysler New Yorker shows another version of Chrysler Corporation’s “up and over” vinyl roof look. “SIMULATED CONVERTIBLE” – features vinyl material that simulates the grain of convertible top material, along with metal bars underneath to create a three-dimensional appearance of metal brackets underneath a softtop roof. Here, a 1980 Chrysler Cordoba is an example of the type of roof covering most popular from 1977-82 when American convertibles were noteably absent from production. A customized 1980 Chrysler Cordoba convertible, shown with top down. 1980 Chrysler Cordoba customized convertible, with top up. Because Frank Sinatra helped the struggling Chrysler Corporation in 1980 by doing an advertising campaign free of charge, he got to drive the first new Imperial off the assembly line during the fall of 1980. Frank Sinatra Edition Imperials were available during 1981 and 1982 model years. 1983 CHRYSLER IMPERIAL with wire wheel covers. A 1983 Chrysler Imperial photographed on Fremont Street in Las Vegas during 1999. The March 21, 1983 issue of Time Magazine featured then Chrysler Corporation CEO Lee Iacocca, with the new-for-’83 LeBaron Town & Country convertible. “LANDAU” – This style covers only the rear portion of the roof. Landau roofs were used equally on coupes and sedans. Shown is a 1988 Chrysler Fifth Avenue. This Chrysler trend of integrating part of the rear door with vinyl covering was used on many of their models in the 1980s, and proved quite popular with buyers. CHRYSLER IMPERIAL concept car, at the Detroit Auto Show January 2006. A 1965 Citroen 2CV sedan, seen on the streets of new York City, Christmas day 2013. “UP AND OVER” – Here a 1973 Dodge Charger features a creative vinyl roof covering not often seen. This 1974 Dodge Challenger was one of many equipped with the vinyl roof option, which goes to show this option was so popular by the mid-’70s that it was considered normal…even on muscle cars. 1991 DODGE RAM police van in service at Point Pleasant, NJ July 2013. The 18-inch Chrysler Corporation steel wheel that has been in use on Dodge Charger police cars since 2007. Cameron’s garage that housed his father’s 1961 Ferrari 250GT California Spyder in the movie “Ferris Bueller’s Day Off” was designed by architects A. James Speyer and David Haid in 1953. With a capacity for six cars, this garage appears more like a showroom. Above: the new-for-1928 Ford Model A coupe is an example of the first type of automotive vinyl roof popular during the mid-1920s to early ’30s designed to evoke memories of horseless carriages. 1936 FORD convertible with grille and V8 emblem. From 1950-51, Ford offered vinyl on coupe versions of four of its models to simulate convertibles. 1950 Ford Crestliner coupe shown. A 1956 Ford Thunderbird equipped with the same wire wheel add-ons. Here, they are fitted over full original Thunderbird wheel covers here. A 1956 Ford Thunderbird 2-seat roadster equipped with factory authentic wire wheels. A full-size 1963 Ford Galaxie coupe with a pseudo-convertible vinyl roof. When Ford introduced the 1964 Mustang, vinyl was there too. Here, a 1965 Ford Mustang convertible is one of many rolling off this assembly line. Jay Leno in his restored 1966 Ford Galaxie 7.0-liter, identical to one he helped “persuade” his father to buy new. “HALO” – this type is similar to full vinyl roofs, but the vinyl stops just short of the tops of the side windows and windshield, allowing a “halo” of painted sheet metal to appear between vinyl and glass areas. This 1971 Ford Torino coupe is an example of how many halo type vinyl roofs looked originally. 1977 FORD LTD II police car once used by Lincoln, Nebraska police. Ford offered this creative style of vinyl roof covering on 1977-1979 Thunderbirds and Mercury Cougars that combines “canopy” and “landau” styles. 1979 FORD LTD II formerly used by the New Jersey State Police. 1994 Ford F-250 fitted with a sleeper cab section. Vinyl roofs were an option on 1950-51 Frazer models, such as this 1950 four-door sedan. 1949 JAGUAR XK120 hood view. Just over 10,000 Jaguar XJC hardtop coupes were produced during the 1975 – 1977 model years, powered by either an inline 6-cylinder or V12 engine. All of them left the victory with vinyl roof coverings. Here, fully assembled Jeep CJ5s come down one line, and Wagoneers in another. Late 1960s or early 1970s vintage. The owner of this 2006-11 Jeep Commander we spotted had a non-original wood trim package installed. Like us, they must appreciate Grand Wagoneers. Kaiser Motors also offered vinyl roofs for a short period during 1950-51. 1951 sedan shown. A look at one of the 2004 Discoverys actually used in company-sponsored G4 global off-roading events. An example of a Discovery equipped with black 16-inch Land Rover steel wheels. Many owners modify their cars with two- or three-inch suspension lift kits. With a stock unlifted suspension, the highest profile tires that would fit within the wheel wells without rubbing are 255/75-16s. Raising vehicle suspensions can put greater strain on driveshafts and axles since they must operate at more extreme angles. These 16-inch black steel wheels were often used by Land Rover on manufacturer sponsored off-road safari challenges. While they were never on the factory order sheet, many owners fit their Discoverys with them. Several wheel manufacturers produce versions of these, some with more backspacing than others. (Wheels with a lower amount of backspacing will stick out wider than stock from wheel wells). A 2003 Land Rover Discovery SE with 16-inch steel wheels and 265/75-R16 tires. Two- and three-inch lift kits will accommodate this size of tire without the need to remove the front bumper cover for clearance. The second generation Land Rover Discovery was produced during the 1999 – 2004 model years. Shown, a 2004 Discovery SE7. 2004 Land Rover Discovery, view from above. Image of a European market 2004 Land Rover Discovery equipped with a 5-speed manual transmission. Access to third row seats on models so equipped is not like most SUVs – you enter by opening the rear tailgate and walking between the two seats. 2003 Discovery HSE7 shown. A better view of the two third-row seats, which stow up and to the side. A view from behind the wheel of a 1978 Lincoln Mark V. See our “DRIVER SEAT VIDEOS” to watch this one and others. A 1979 LINCOLN MARK V in black diamond fire metallic paint. Closeup look at a 1977 LINCOLN MARK V opera window on a model without the vinyl roof option. 1977 LINCOLN MARK V BILL BLASS EDITION. Midnight blue non-metallic paint with chamois pigskin grain landau vinyl roof. (1977 LINCOLN CONTINENTAL) “Town Car” edition in midnight blue with full chamois valino grain vinyl roof. This car features the power glass moonroof option. 1979 Lincoln Continental Collectors Series sedan. (1989 LINCOLN TOWN CAR) Like most American luxury cars of the 1980s, 100% of Lincoln Town Cars from 1980-89 were equipped with either full or landau padded vinyl roofs. 1989 Town Car shown. A 1997 Lincoln Town Car limousine, built for uncertain future days. Seen on the streets of New York City, Christmas day 2013. 1986 MAZDA RX-7. The second generation of the RX-7 ran from 1986-1991. 1988 MAZDA RX-7 convertible. Spanning the 1988-1991 model years, the RX-7 convertible was unique to the generation II body style. A 1952 Mercedes 300SLR Carrera Panamericana race car grille. This was an early version of the production 300SL gullwing coupe introduced for 1955. The interior of an early Mercedes 194-body SL gullwing coupe racing prototype, produced in 1952. 1956 Mercedes 190SL owned by Claire Wegner. 1955 Mercedes 190SL with hardtop roof panel in place owned by Bob Platz. 1955 Mercedes 190SL with hardtop roof in place owned by June Platz. This late 1950s Mercedes 190SL receives its 4-cylinder engine. 1960 Mercedes 220SE coupe owned by Bruce Ianelli. The new creation is 8 inches longer than original 1955-63 190SLs. Body panels were cracked and lengthened at 5 separate points from front to back. 1964 Mercedes 230SL owned by Jerry Robinson. 1964 Mercedes 230SL owned by Jerry Robinson at check-in. Hood view of a 1965 Mercedes 190D. 1965 Mercedes 190D owned by Classic Cars Today contributor John Bleimaier. A 113-body Mercedes 230SL / 250SL rolls off the assembly line sometime between 1963 and 1967. This bodystyle adopted the one-piece wheel covers in 1968. 1967 Mercedes 250SE coupe owned by Keith Morgan. “California Coupe” models were a variation of the Mercedes 250SL, produced from December 1966 through January 1968. A fold-down rear seat was fitted in the space where the soft top well and related equipment normally went. The rear fold-down seat of a 1967 Mercedes 250SL California Coupe. Here the new-for-’68 Mercedes “113 body” E-class sedans roll off the assembly line. In the background, a 280SL and a final-year ’68 Finback sedan are visible. The “115-body” Mercedes E-Class ran from model years 1968 – 1976. Here, a Euro market 1968 Mercedes 230 is shown. 1968 Mercedes 250SL owned by Mickey Wilson. 1970 Mercedes 280SL equipped with original equipment 14-inch wheels that first became available in 1969. Hood view of a 1963-71 style Mercedes SL, as seen on a ’71 model. A behind the wheel view from a 1971 Mercedes 300SEL 4.5. See “DRIVER SEAT VIDEOS” section of our website to see the video. 1971 Mercedes 280SE 3.5 Cabrio owned by Richard Raskin. The 1971 280SE Convertible was the last four-seat Mercedes ragtop produced until the 300CE Cabrio was introduced twenty years later. 1970 Mercedes S-class hood view. 1971 Mercedes 250 owned by John Longo. Trunk view of 1971 Mercedes 250 owned by John Longo. 1971 Mercedes 280SL owned by W. Franklin Richardson. 1972 MERCEDES 350SL. Only 1972 and 1973 U.S. model SLs featured the small bumpers that Euro models kept through 1989. American models were usually fitted with vertical buffer pieces. 99.9% of all Mercedes “bundt” style wheels of this 1969-85 design were 14 inches in diameter. It’s a little-known fact 15-inch factory versions of these wheels (shown here) have been available all along. These 1974 U.S. market Mercedes 240D models are prepared for shipping. The high-powered, low-production Mercedes 450SEL with a 6.9 liter V8 was sold through model years 1976-80. U.S. versions (as shown here) had rubber covering the full bumper widths. An early European 123-body Mercedes 280E, photographed in 1975. On January 27, 1976, the 123 mid-range passenger car model series was presented as the replacement for the 114/115 model series. Until the end of its production in November 1985, close to 2.7 million vehicles of the 123 series had left the factory. 1977 MERCEDES 230C equipped with aftermarket wire wheel covers and a “230CE” badge from a later model of 1980-85 vintage. (1978 MERCEDES-BENZ 450SEL 6.9) This low-volume subset model replaced the standard 450SEL’s 4.5-liter engine with a high-performance V8 of 6.9 liters. Referred to by many as simply the “6.9”, these were produced from model years 1976 through the last year of this S-class bodystyle in 1980. 1978 Mercedes 240D owned by Cindy Fischer. This 1979 Mercedes 300D owner is fitting tire chains to climb a snowy mountain pass in Mount Buller, Australia. In this 1979 photo, a Mercedes 123-body wagon sees final assembly in Germany. 1979 Mercedes 250T Euro-spec wagon customized with real wood. The final model year of 116-body S class production (1980) overlapped with the 126-body S-class that replaced it. Here, a 1980 450SEL 6.9 European model is shown on display at MB headquarters in Stuttgart. 1980 MERCEDES 450SEL 6.9 European model. A 1980 model short-wheelbase 126 body is photographed on Mercedes-Benz’s test track in Germany in late 1979 along with the three prior generations of S-class models. A prototype Mercedes 126-body S-class undergoes durability testing during 1979. A mechanical drawing of the new-for-1980 short wheelbase 126 body sedan. A prototype 1980 Mercedes 126-body S-Class undergoing wind tunnel testing during 1979. 1980 MERCEDES 126-BODY S-CLASS short wheelbase. 1980 Mercedes 450SLC owned by Michael Goldberg. A 1980 MERCEDES 380SE euro market model. Note the absence of optional headlamp washers usually fitted to these vehicles. Mercedes 123-body midsize factory limousines were offered from model year 1979 through 1985. Mercedes W123-body factory limousines featured fold-up seats between the rear bench and the front seats. When deployed, these limos could carry 8 people. One year later, long-wheelbase 126 models debuted for the 1981 model year as seen here. (1981 MERCEDES 500SEL) 3-time Formula 1 world champion Nelson Piquet picking up his new ’81 500SEL at the factory. (1981 MERCEDES 500SEL) Formula 1 World Champion Emerson Fittipaldi picking up his ’81 500SEL from the factory in late 1980. 1981 Mercedes 300TD wagon owned by Alex Rosner. A 1981 Mercedes 500SEL, Galaendewagen, and 123-body sedan are visible in this picture taken in a Paris Mercedes showroom. When my father received a one-time sudden windfall in 1980, he decided it was finally time for a “really nice” car. Luxury cars such as the Mercedes 240 Diesel I advised him to buy were not normally in my family’s budget growing up. I presented him with many logical arguments in my attempt to sway his decision. A 1977-85 style Mercedes “123 body” photographed at twilight. 1982 Mercedes 300GD Gelandewagen 2-door owned by Michael Mendes. Side view of a 1981-85 long-wheelbase Mercedes S-class (1983 380SEL shown). Shifter gates were updated for 1983 to properly read “D-3-2″ and feature a 1st gear detent marked “B” to the right of 2nd gear position. Transmissions normally started in 2nd gear unless first was manually selected this way. 1983 MERCEDES 300CD coupe in matte black finish. 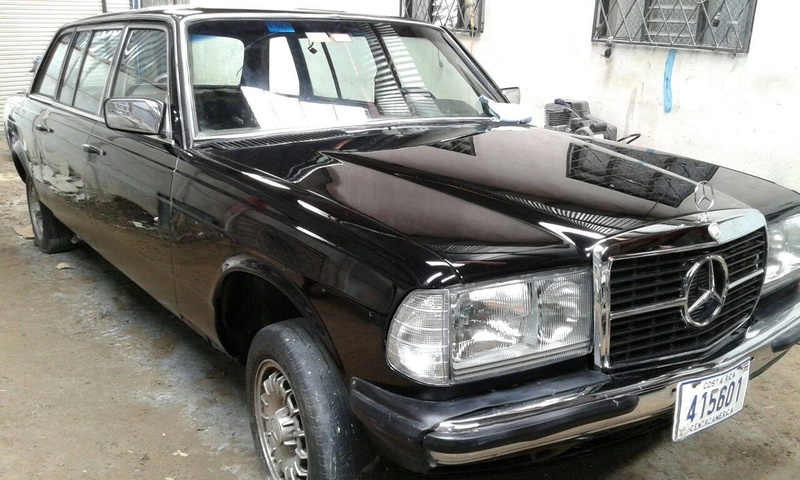 1983 MERCEDES 300CD in matte black finish. Trunk view of a 1983 MERCEDES 300CD in matte black finish. 1984 MERCEDES 300D with 15-inch aftermarket bundt wheels manufactured by ATS. This 1984 MERCEDES 300D with 15-inch aftermarket bundt wheels makes it easier to see the differences ATS took to avoid copyright infringement. This owner has fitted his 1984 Mercedes 280SE with color-matched 14-inch wheel covers from earlier models. A Euro-market 1984 Mercedes 280SE (126 body S-class) with painted wheel covers from previous-generation models. The 500SEL was finally brought to the US for 1984-85, and was the sole long-wheelbase model during those years. A 1984 500SEL upgraded by German tuning house AMG. Engines were bored out to larger displacement for more power, and suspension and brake systems were upgraded for performance. Wheels and lower spoiler pieces shown on this ’84 were installed by AMG, and headlight assemblies were converted to Euro flush assemblies. 1984 MERCEDES 190E (W201 body) factory picture. 1984 MERCEDES 190 factory picture. 1985 Mercedes 300TD wagon owned by Mike Schwab. 1985 Mercedes 300CD owned by Carl Belt. This 1985 Mercedes 500SEL convertible was created for the Dutch Royal family by customizer Carrosserie Caruna out of Spreitenbach Switzerland. 1985 MERCEDES 300D at Mercedes-Benz USA headquarters in Montvale, N.J.
By the end of 123-body production in November 1985, close to 2.7 million of them had left the factory. 1985 MERCEDES 300D, U.S. model. 1985 Mercedes 300D in autumn, photographed October 2013. From left to right, this picture shows a 1985 Euro market 190E, 300E (newly introduced), and 126-body S-class. A Mercedes-Benz factory promo picture for the Euro market 1986 300SL. A 1986 MERCEDES 560SE Euro-only model front view. If you’ve ever wondered what a 1986-91 S-class would look like with older style wheels, this one is equipped with 15-inch factory “bundt” style alloy wheels. Original 14-inch bundt wheels would not clear the larger front brake rotors equipped on 1986-on models. A MERCEDES 190E front end clip, perched atop Precision Auto classic Mercedes specialists repair shop in Rockaway, New Jersey. 560SLs kept the original ’72 style headlights and ’74 bumpers through 1989 (1986 560SL shown). These 15-inch aluminum wheels were standard on all SLs from 1986 – 1989. 1986 Mercedes 560SL. As required by U.S. federal law, all 1986 and later vehicles featured third brake lights mounted up high in the center area. Base European 126-bodies featured 15-inch steel wheels from 1986-1991 (instead of 14-inch ones). Here, a 1986 300SEL Euro model wears base 15-inch plastic wheel covers. An overhead view of the 107-body proportions (1988 560SL shown). 1986 MERCEDES 190D 2.5 factory picture. 1988 Mercedes 190E customized convertible. A closer look at the hardtop coupe version of the 300CE, introduced years earlier as a 1988 model. Euro-only 300SLs from 1986-89 featured an inline 6-cylinder engine and could be ordered with a 5-speed manual transmission. Notice the original slim bumpers from 1972 were still used. Euro market 1989 Mercedes 300SL. In the late 1980s, Mercedes created a prototype 1989 190E cabriolet. The concept 190E convertible never saw production. Here, a would-be 1989 model is shown with the top up. Today, the 1989 190E convertible styling exercise is on display at Mercedes-Benz headquarters in Stuttgart, Germany. 1989 MERCEDES 190E Cabriolet concept car on display at company headquarters in Stuttgart. A final-year 1989 Mercedes 107-body SL. Side view of a 1986-1991 long-wheelbase Mercedes S-class (1990 560SEL shown). 1991 Mercedes 420SEL in desert taupe color. (1991 420SEL shown) While lower plastic bodycladding had been painted gray on most 126s through 1988, it was closely matched to body colors on 1989-91 models. Black and white cars were the exception. (1991 MERCEDES 500SEL) The 500SEL was the only 126 body S Class to run with the same model name and engine through the entire 1980-1991 body run. All other 126 model designations were changed in 1986. A European market promotional photo introducing the 124 body Cabriolet for the 1992 model year, one year earlier than in the United States. Cabrios were sold through the 1995 model year in the U.S., and through 1997 in parts of Europe. (1992 MERCEDES 300CE Cabrio) Early Euro-market Cabrio models such as this one were equipped with slightly different wheels that did not see production on U.S. versions. 1992 Euro models were introduced as the “300CE-24” reflecting the 24-valve 3.0-liter engine fitted that year only. For 1993, the 3.0-liter was enlarged to 3.2 liters. Although U.S. and Euro markets both got the 3.2, ’93s were badged “320CE” in Europe and “300CE” in the U.S.
A rear 3/4s top-up view of an “early” 124 body cabriolet. This promotional photo introduces the European market 1992 300CE-24 Cabriolet. Promotional photo introducing the U.S. market 1993 300CE Cabrio. Notice the “square within rectangle” headlight assemblies unique to the U.S. market. Headlight wipers were standard equipment. MERCEDES 190E models (201-body chassis). A 1993 Mercedes 400E with accessory rims finished in gun metal gray. 1995 Mercedes E320 coupe owned by Oliver Seligman. 2002 Mercedes SLK320 owned by Carl Schwartz. 2012 Mercedes SLS coupe owned by Ethan Goldman. 2013 MERCEDES CLS with matte finish vinyl covering. The 1950-51 Mercury Monterey coupe was the second of four Ford Motor Company models available with a vinyl roof covering option. A closer look at a 1970 Mercury Cougar equipped with a “houndstooth” vinyl roof. This MGB assembly line photo is of unknown vintage, but is most likely late 1960s or early 1970s. This MG assembly line photo is of unknown vintage, but is most likely late 1960s or early 1970s. Another view of a 1953 Olds with the factory wire wheel covers. Like most American cars from this time, the steel wheels beneath were painted to match the vehicle. Many carmakers in the early ’60s sought to make their pillarless coupes look as much like convertibles as possible. The creases on the roof shown here were actually in the metal roof itself. Adding a layer of vinyl fabric with fake stiching designs only enhanced the illusion. 1965 Oldsmobile Cutlass 4-4-2 with dog dish center hub caps. 1965 Oldsmobile Cutlass 4-4-2 with dog dish center hub cap. A 1970 OLDSMOBILE TORONADO equipped with “Halo” style vinyl roof. 1977 Oldsmobile Cutlass Supreme – this base model is equipped with an extremely rare 5-speed manual and a 260 cubic inch V8. This mock-up was a styling proposal for a 1949 Plymouth was photographed Ju;y 1946. Had it been put into production, it would have come to market looking almost identical to the production 1948 Hudson…a year later. 1958 PLYMOUTH FURY HARDTOP COUPE, similar to many used in the filming of Stephen King’s “Christine”. Pontiac built several mockups of a “Ventura” compact car using Chevrolet’s upcoming rear-engined Corvair model. Ultimately, when they introduced their own compact for production as a 1961, it was instead called the Tempest and built on the traditional Buick Special / Oldsmobile F-85 platform. This mocked-up “Ventura” was photographed in the styling studio on April 6, 1959. Here, a 1969 unibody Pontiac Firebird and body-on-frame Chevrolet Impala roll down a General Motors assembly line in Detroit, Michigan. 1970 Pontiac Grand Prix models receive final inspection. A 1970 Pontiac Grand Prix nears completion on the assembly line. 1971 Pontiac LeMans with “The Wall of Hoods” behind it. This 1973 Pontiac Catalina sedan commemorates the 16 millionth vehicle to be built with the Pontiac badge. 1973 PONTIAC PHANTOM concept car, created by Bill Mitchell. 1975 Pontiac Grand Ville convertible, photographed at that year’s Chicago Auto Show. Here, a 1975 Pontiac Catalina sedan driven by the Klopek family – creepy neighbors in the 1988 movie “The Burbs”. (1975 PONTIAC GRAND VILLE) The Grand Ville was Pontiac’s highest line model, produced from 1971-75 in sedan, coupe, and convertible form. The Grand Ville was slotted above the Catalina and Bonneville. 1975 PONTIAC GRAND VILLE. The long road back to 1975 is littered with many would-be classics that didn’t make it. 1975 Pontiac Grand Ville convertible at Somerville Cruise Night 8-23-2013. Staff members of Classic Cars Today Online enjoy an evening out at Somerville Cruise Night. 1979 PONTIAC FORMULA FIREBIRD original 2-tone paint design. 1979 PONTIAC FIREBIRD FORMULA paint package. Rear view of the ’67 Saab 96 coupe. Once clearing customs, cars like this 1967 Saab Sonnett may still be required by individual states to pass through motor vehicle inspections and minor modifications before they can be titled and registered. A 1956 Studebaker Golden Hawk with original equipment Lyons wire wheel covers. “FULL” – this style covers the entire roof, including A-pillars. This 1997 Rolls-Royce reminds us that Europeans were equally seduced by vinyl and had a harder time giving it up than Americans did. A fitted tool box is contained within the center of the spare wheel and tire on this 1957 Volkswagen Beetle. A 1966 Volvo 122S custom coupe, known as the “Amazon”. (19 model years) 1975 – 1993 VOLVO 240 SERIES. While badges 244, 245, 265, etc in earlier years, the 240 series saw several minor front end updates during its lifespan and did the most to put Volvo on the map in the United States. Unlike many automakers, Volvo grafted sedan rear doors unchanged onto wagon versions of the 240. Here a 1991 wagon is shown.